The scene that John describes actually sounds an awful lot like a cliché moment featured in countless teen-focused comedies. At some point during the movie, everyone comes together for the house party to end all parties. Often, the bash is thrown at the home of some guy or girl whose trusting parents are conveniently out of town. While the adults are away, their home is trashed by what must be every teenager in a twenty-mile radius. Usually, we see the teen who lives there running around in a futile effort to put coasters under red solo cups and pick cigarette butts out of the houseplants, all while he tells the unruly partygoers that nobody is allowed upstairs. But in our Gospel lesson, this isn’t just anyone’s house; this is the Temple of the Lord. And Jesus isn’t about to let all of these people desecrate his Father’s house. Coming to Jerusalem, our Lord is infuriated by what he finds there. The Temple looks less like the holy dwelling place of the one God and more like a common bazaar. The sanctity of the place is violated by merchants who loudly barter with pilgrims over the price for a cow or sheep or dove. While they’ve come to make a sacrifice to the Lord, the travelers figure that there’s no reason they shouldn’t get a deal on the sin offering that they present. 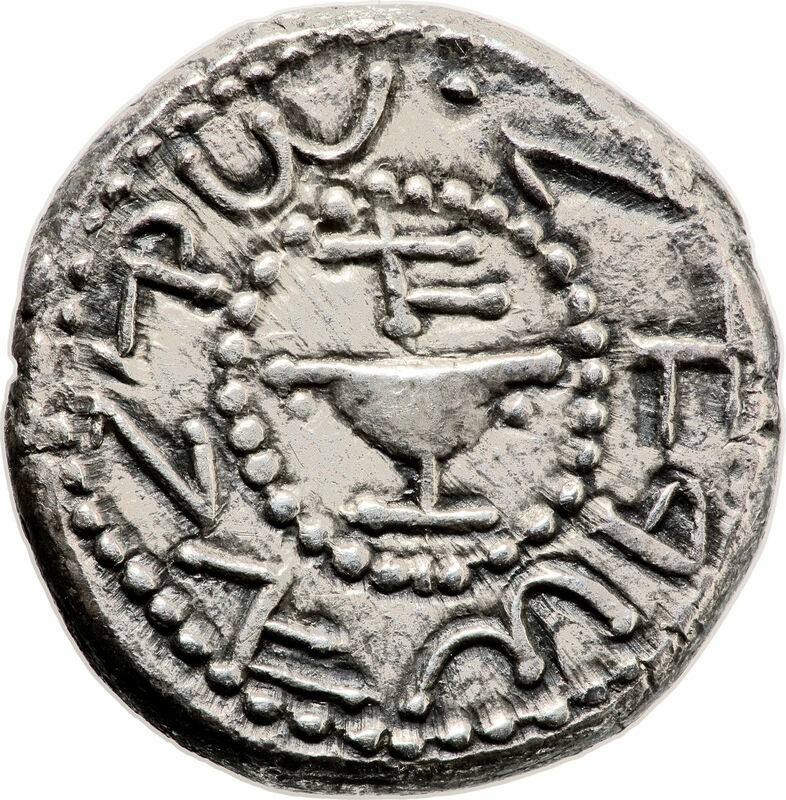 A silver shekel from 66 C.E. Meanwhile, the sound of clinking coins is amplified in the courtyard. Because of the images that were engraved on them, Roman coins were regarded as idolatrous and thus could not be used to offer tithes or to purchase sacrificial animals. But fortunately, the money changers would gladly exchange Imperial currency for Jewish coins, for a small fee. All of these things make the Temple look less like a sanctified place to commune with the Almighty and more like a common stock exchange. And having seen and heard more of this sacrilege than he can bear, Jesus’ temper boils over in a way that we don’t see elsewhere in the Gospel. As he fervently drives all of the livestock out and overturns the money changers’ tables, he thoroughly disrupts the commercial market that had been profiting so well from the Temple. And as we witness Jesus in truly rare form, the sight might make us a little nervous or even afraid. After all, this isn’t the way we are used to thinking about our Lord. More often, we see him as the Good Shepherd who lovingly carries the exhausted lamb on his shoulders. But here, we are faced with the harsh reality that sometimes that same shepherd has to take up the task of violently driving away the lions. And though Jesus’ response seems out of character with the depiction we normally have, his own disciples are reminded of the words of Psalm 69:9: “It is zeal for your house that has consumed me.” Though the Gospel writer doesn’t mention it, the second part of this verse states that “the insults of those who insult you have fallen on me.” In their offense against his Father, the money changers and the animal sellers have all personally insulted Jesus. But the Jewish leaders believe that Jesus is out of line. What right does this itinerant rabbi from Galilee think he has to come into the Temple and disrupt the well-maintained practices for efficiently and economically providing for the worship needs of the Jewish people? Who does he think he is to claim the Temple as his “Father’s house?” If he is going to make such bold demands, the leaders expect him to provide them with a sign to justify his actions. But as he often refuses to do in John’s Gospel, Jesus does not speak plainly here. The sign he offers is one that would only be understood by his disciples after his resurrection. In the moment, the Jewish leaders think that Jesus is truly asking them to tear down the Temple, so that he can rebuild it in an unfathomable three days. Many of us probably feel like we have had to endure some unending construction projects in our lives. After a while, we just accept the traffic delay in roadwork sites as a normal part of our daily commute. When we see those barrier walls that never seem to come down, marked with “Pardon our dust” signs, we eventually stop wondering if the construction happening on the other side will ever be completed. But of course, at some point, the work does end and the finished project is made available for all to enjoy. Not so with the Temple reconstruction. Having already been underway for forty-six years at the time when our Gospel lesson is recorded, the Herodian temple would never be completely rebuilt. It was a continual work in progress up until the moment it was destroyed during the Roman sack of Jerusalem in the year 70. Such grand construction projects, which were the hallmark of many ancient empires, required the devotion of massive amounts of time, labor, and resources. So the suggestion that one man could rebuild such a landmark as the Temple in a mere three days was utterly preposterous. David Roberts’ 1850 painting, “The Siege and Destruction of Jerusalem by the Romans”. Yet, what Jesus is truly proposing is even more unimaginable for the Jewish leaders. In speaking of himself as the Temple, our Lord reveals that he knows both of his coming death and of the bodily resurrection that would follow. And though he does not reveal it here, the greatest miracle comes in the ability of Jesus to share in this resurrection with all who repent and have faith in him. But if we are to be built up with Christ on Easter morning, we must first welcome our Lord into these broken temples of our bodies. We must ask God to “pardon our dust” so that our old broken selves might be replaced with that which is new and incorruptible. In this act of repentance, God comes through the Holy Spirit to cast out the iniquities that marr us in body, mind, and spirit. Just as Jesus sought to rid the sacred temple space of that which was common, God drives from us the things common to this world, so that we each might become a dwelling place worthy of the Lord. The end result is something so thoroughly different, it is as though God had razed us to the ground and rebuilt us completely anew. No longer shall our devotion to the Lord share space in our hearts with our selfish desires or with the conflicting interests of the world around us. In the temple that God erects in the faithful Christian, there shall dwell no one but the Lord alone. But today, as we continue on this Lenten journey, we must confess that we are far from the perfect structures that we long to become. Each of us is called in this season of penitence to come to the Lord in prayer, so that God might reveal that which may be repaired and that which is simply to be driven out. Often, it is easier to identify the latter. We hear the commandments of God, first spoken to Moses, and quickly identify them as the Law by which all else must be judged. God’s word calls us to oppose that within us which would drive us to idolatry, hatred, violence, dishonesty, and covetousness. Such things are wholly impure and have no place in God’s presence. However, our greatest struggles often come as we try to identify the places where we need to ask God to do some renovation. We pray for health, but we struggle to keep up a good diet, to exercise regularly, to heed the instructions of our physicians, or abstain from the vices that degrade our bodies or minds. We pray for God to intervene on behalf of the poor and the downtrodden, but we foolishly picture ourselves relatively unempowered to serve them ourselves. We worship God on Sunday morning, yet we are ashamed to uphold Christian values of unmitigated love for neighbor, or the unending pursuit of peace, or the call to share God’s Good News of salvation, all because we don’t want to be labeled as zealots. In moments like these, when we are struggling to be moved from contemplation to action, we need to ask God to come in and to cleanse these temples, so that we might be filled with the same zeal that overtook our Lord Jesus. Today, we need to come before the Lord, asking God to “pardon our dust”—to forgive us of our failures and our shortcomings. As we do so, let us give thanks for the promise that even as we might be reduced to rubble as a consequence of our sin, God’s restoration at work through Christ means that we who believe shall be built up again. We shall be resurrected. In the name of the Lord Jesus Christ, we bend our knees and lift up our hearts, giving glory to God forever. Amen. This sermon was delivered at Bowling Green Presbyterian Church on Sunday, March 08, 2015 (The Third Sunday in Lent). This entry was posted in Sermons and tagged Lent, Restoration. Bookmark the permalink.